Manchester United midfielder Fred has admitted he did not agree with the penalty awarded to Arsenal striker Alexandre Lacazette in yesterday’s 2-0 defeat at the Emirates Stadium. The Brazil international was adjudged to have brought Lacazette down in the penalty area moments before Pierre-Emerick Aubameyang stepped up to give the Gunners a two-goal lead and kill off the game. 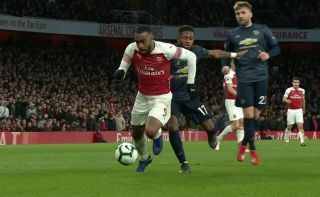 This gave Arsenal a rare win over Man Utd, and it does seem pretty clear they got a major helping hand from the referee as Lacazette did seem to go down rather easily. Fred was certainly not happy, with the former Shakhtar Donetsk man making his feelings clear after the game in an interview with ESPN. ‘It wasn’t a penalty, I touched Lacazette on his upside on a normal game situation,’ he said. ‘If it was in the middle of the field, I believe he wouldn’t whistle, but he decided to give the penalty. Arsenal fans won’t be too bothered, however, with Gooners likely to have many memories of United benefiting from dodgy penalty decisions against them down the years. This, meanwhile, was the first penalty the north London side had awarded to them against the Red Devils in 17 games against them in all competitions.